Happy Friday! Today I'm keeping it short and sweet. I hope you all had a fabulous week and have an awesome weekend! I'm excited for next week, because I will start outfit posts! I have had this color for over a year now and it came in this itty bitty bottle, and has been discontinued I absolutely LOVE this color. I think it's a great color for transitioning into the spring. One reason I really love this color is because you can wear it dark or light. In the photo I am wearing just one coat of it. The closest color I have ever been able to find of this is Sephora by OPI Casting Call. I also like it because it still looks great without a topcoat, but right now I'm obsessed with glitter top coats! 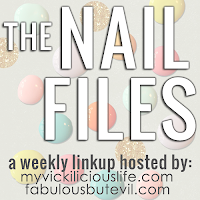 Hi Aisha, just browsing through the Nail Files link ups. This is a really pretty soft pink color...love it! Love the mani! The accent nails are so pretty! It really is a great color for transitioning into spring. I like it! both of those colors are so pretty!